The Spark® multimode microplate reader - your research partner. Easy selection of one of the four preset configurations for a specific application segment provides a fast solution to solve your research problems. The fully configurable platform also gives you the freedom to personalize your own Spark reader. The Spark is also upgradeable so that you can add modules at any time in the future. Four configurations for today. Ready for tomorrow. 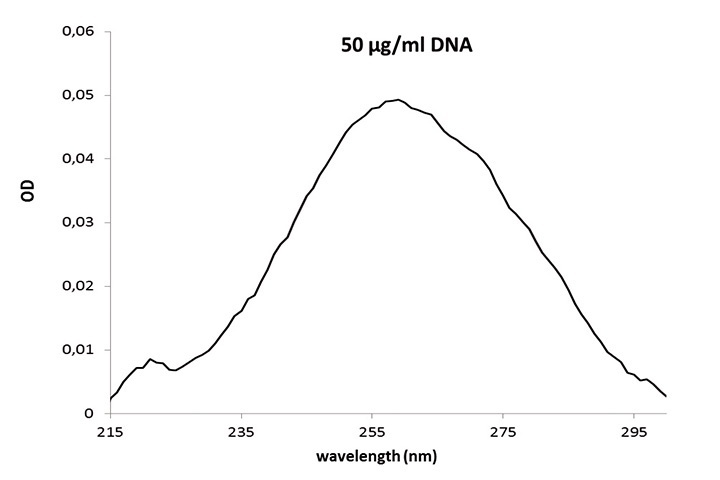 DNA spectrum of a 50 μg/ml sample after blank reduction; a 2 μl sample volume was measured in Tecan’s NanoQuant Plate. The innovative design of Spark’s High Speed Monochromator delivers an absorbance spectrum between 200-1,000 nm in just five seconds using a step size of just 1 nm, effectively eliminating the risk of sample evaporation. Spectral recording is performed with unsurpassed wavelength accuracy and reproducibility (<=0.3 nm), generating consistent data for every sample. 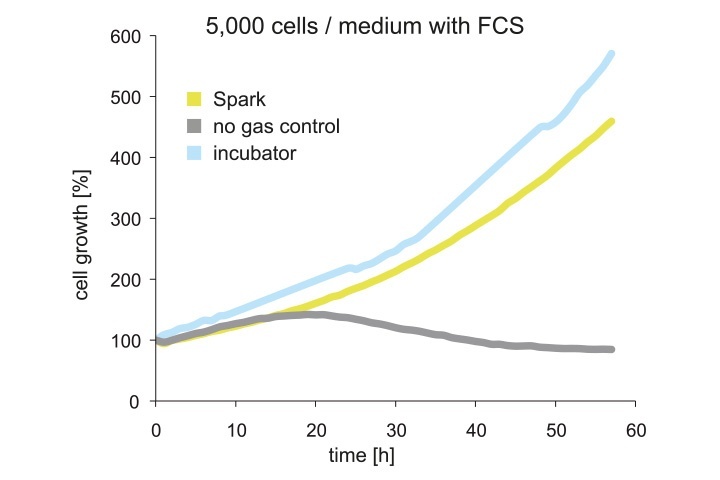 This combination of speed, accuracy and reproducibility makes Spark the instrument of choice for low volume nucleic acid quantification and purity checks. The image shows OD linearity from 0 to 4 OD measured at 260 nm. Spark’s exceptional wavelength accuracy and reproducibility, combined with the unique design of Tecan’s NanoQuant Plate™, result in a DNA detection limit of <1 ng/µl. 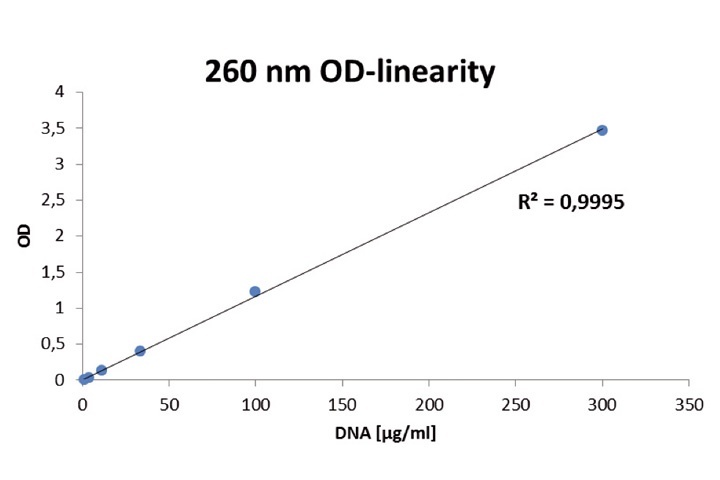 A good wavelength ratio accuracy in A260/280 or A260/230 is crucial for DNA/RNA purity checks, ensuring repeatable and reproducible data, but this parameter is not specified for most systems on the market. Spark’s ultra-fast spectral recording enables you to perform whole spectrum wavelength scans for all 16 samples in the NanoQuant Plate without the risk of evaporation, which is a well-known issue for other monochromator-based absorbance instruments. The NanoQuant Plate can simultaneously measure up to 16 samples, with sample volumes of as little as 2 µl easily applied to individual quartz micro-spots using conventional single or eight-channel pipettes. Each quartz micro-spot is shaped to function as an individual lens – guaranteeing the best possible light transmission through the sample – and can be quickly and easily cleaned to minimize the risk of cross-contamination. Closing the plate lid effectively creates 16 quartz micro-cuvettes with a fixed path length of 0.5 mm – perfect for 230, 260 and 280 nm measurements. For convenience and optimal data quality, the NanoQuant Plate is the only low volume plate on the market that is 100 % calibration free, maintaining reliable performance while minimizing demands on your time. This innovative tool truly is a prerequisite for sensitive, reliable and easy DNA/RNA quantification in your laboratory. In addition to absorbance measurements, the NanoQuant Plate can be used to detect fluorescence signals in low volume samples. Simply pipette 2 µl samples from your fluorescence assay – for example, the Quant-iT™ PicoGreen® dsDNA assay – onto the NanoQuant Plate and use Spark to detect the fluorescence signal. Combining the NanoQuant Plate and Spark offers the ultimate solution for nucleic acid quantification. 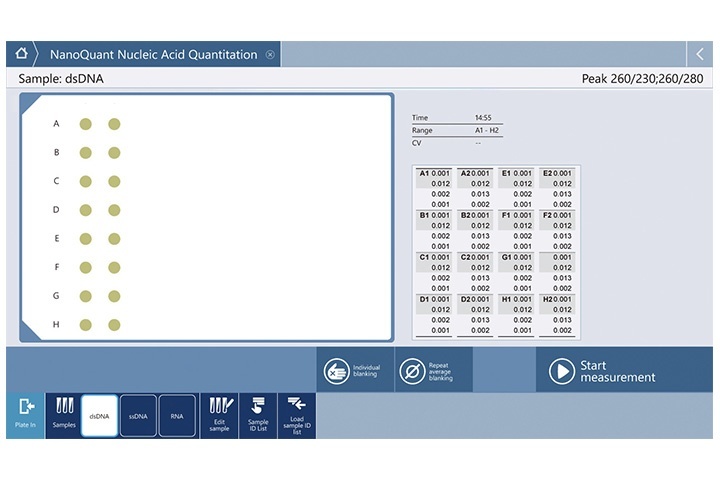 SparkControl™ software offers a preconfigured, ‘one-click’ method for nucleic acid quantification, giving you quick, easy and reliable results at the touch of a button. The detection limit of ssDNA is specified at less than 1 ng/µl using the NanoQuant Plate in combination with Spark’s High Speed Monochromators. Spark can be equipped with filters, Tecan’s state-of-the-art QuadX Monochromators™ double monochromator system or a combination of both. 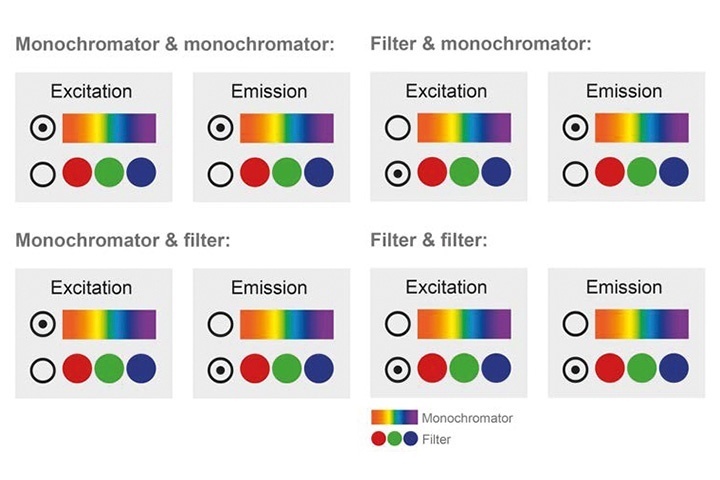 Unlike hybrid multimode readers, this concept allows users to independently choose between filters and monochromators for both excitation and emission. 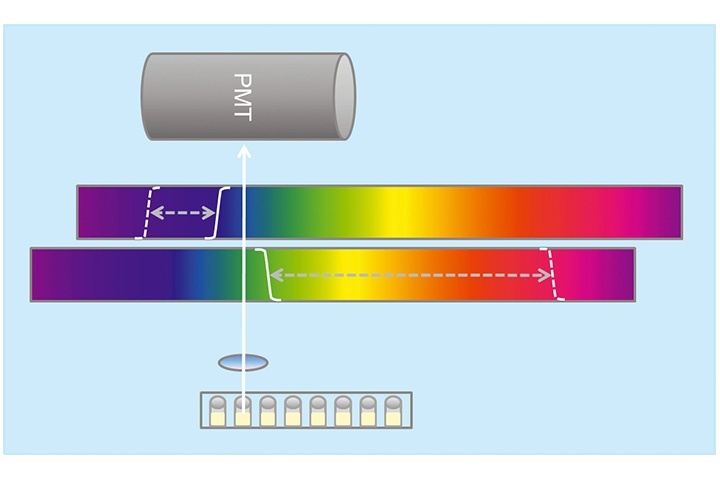 This unique feature is available for all fluorescence-based detection modes – including standard top and bottom measurements, TRF, FRET, TR-FRET and FP –delivering very low detection limits and unlocking new possibilities. SparkControl software provides effortless control of the system, enabling easy selection of filters or monochromators on the fly. Glow luminescence linearity of the of the Spark using optimized conditions. Spark uses luminescence fibers optimized for each plate format – 96, 384 and 1,536 wells – guaranteeing minimum signal crosstalk between wells. The light is guided through an innovative filter wheel consisting of multiple attenuation filters – reducing high signals by a factor of up to 1,000 – and 38 user-selectable colored filters, enabling virtually any multi-color luminescence measurement. The resulting signal is detected by a photomultiplier tube (PMT) operated in its most sensitive mode; photon counting. This unique combination of optical components ensures maximum sensitivity for weak luminescent signals and allows attenuation of high signals. The result is an industry-leading dynamic range of 109, combined with exceptionally low detection limits for glow and flash luminescence. Most plate readers use a fluorescence emission monochromator for luminescence multiplexing or scanning, leading to inferior results and an unacceptable drop in sensitivity due to attenuation. To overcome this limitation, Spark uses a unique filter technology based on 19 pairs of short- and long-pass filters. With just a few clicks, you can select the desired wavelength and bandwidth for multi-color luminescence measurements or spectral scans. This makes Spark a future-proof set-up for multiplexed assay systems (such as Chroma-Glo™), BRET applications – including NanoBRET™ – and luminescence spectral recording. Flawless performance of Alpha Technology assays requires high quality instruments. Spark combines a high power laser light source with an innovative filter wheel and dedicated photon counting PMT for ultra-sensitive detection of Alpha assays. Spark is equipped with a unique IR temperature sensor enabling well-by-well temperature correction during measurements, overcoming a well-known challenge of Alpha assays. This is complemented by Spark’s Te-Cool™ module for stable temperature management, even below ambient, giving you full control over this critical assay parameter. These features ensure Spark offers uncompromised performance for AlphaScreen®, AlphaLISA® and AlphaPlex® assays, as well as potential future Alpha Technology applications. Cell counting and cell viability assessment of trypsinized cells is a daily task in any cell culture lab. Spark’s cell imaging module offers automated label-free cell counting and trypan blue-based cell viability analysis with an easy-to-use, disposable Cell Chip. Each chip has two sample chambers which can accommodate 10 μl of cell suspension, and four Cell Chips can be loaded onto the Cell Chip adapter, allowing eight samples to be analyzed in less than two minutes. In general, you don’t know how many cells have adhered to the bottom of a microplate well, or even grown, over a certain period of time. Determination of cell confluence and estimation of cell numbers are therefore important for reproducible assay results and interpretation of experimental data. With Spark’s cell imaging module, you can automatically assess the precise confluence – from 10-90 % – giving you a new level of data quality in your assays. Gap closure by SkChA-1 cells (biliary tract cancer cell line with high migrating potential) over 30h. Spark is equipped with precise temperature control to enable uniform heating of you microplate. To help ensure even temperature distribution, the microplate chamber is thermally isolated from the optics, guaranteeing stable and precise temperature regulation for your assays. Spark adds another layer of environmental controls by putting CO2/O2 partial pressure control at your fingertips. An integrated Gas Control Module (GCM™) offers CO2 regulation from 0.04 to 10 % (vol. ), and O2 from 0.1 to 21 % (vol. ), creating an ideal environment for your cells. CO2 regulation maintains cell health during long-term kinetic studies, while O2 control allows you to maintain the correct atmosphere for microaerophilic organisms or mimic physiologic conditions. Generating growth curves with bacteria or yeast also requires effective plate shaking. Based on years of experience and knowledge of working with cell lines in microplate readers, Spark was specifically engineered for long-term shaking and incubation of micro-organisms. Easy-to-use SparkControl software gives you straightforward control of these features, placing the best conditions for your live cell assays in your hands. Humidity regulation at levels of 95 % or higher is another key element for good cell viability and growth, and minimizing evaporation is essential for maintaining constant concentrations during long-term assays. Spark’s Humidity Cassette is a cost-effective solution to minimize evaporation in any SBS-format microplate. This patented tool incorporates a filling moat and has a specialized lid for use with our unique Lid Lifter, giving you passive humidity control for any assay. Simply add ddH2O to the filling moat and you have an instant, no-fuss humidified atmosphere in your microplate chamber. Spark gives you access to a new type of automation – integrated lid lifting – creating new workflow possibilities, reducing the risk of sample contamination and helping to establish an ideal environment for long-term kinetic assays. Whether you want to dispense compounds without the need for manual intervention or maintain optimal environmental conditions without comprising evaporation protection, Spark is the only reader up to the task. SparkControl combines automation of long-term kinetic assays with advanced features such as kinetic conditioning, remote operation and Open Kinetic, providing a hands-off solution for complex experimental set-ups. Many live cell kinetic experiments require specific actions – for example, addition of a compound – once a certain signal level or OD value is reached. Multimode readers equipped with manual environmental controls can make these types of study cumbersome or error-prone. SparkControl’s kinetic conditioning feature allows you to program the system to automatically perform a required action as soon as a predefined signal is reached in a control well, fitting almost any assay workflow you can think of, in un-lidded or lidded microplates. SparkControl’s remote control feature allows you to monitor or operate the instrument from outside of the lab. This enables full system control without the need to sit in front of the reader for hours; if you are connected to the internet, then you are connected to your experiment. A multimode reader is frequently used for multiple applications by various users. Long-term live cell kinetics assays can block the reader for an entire day, limiting overall lab throughput. SparkControl offers an efficient solution: Open Kinetic. This feature allows you to pause and resume kinetic experiments, enabling additional measurements to be performed throughout long-term studies. This frees up the instrument for other users, eliminating one of the major bottlenecks of shared lab equipment, without compromising your valuable research. The target temperature isn’t always 37 °C in all biological situations. For example, zebra fish larvae need to be at 25 °C, and insect cells (Sf9) require 22 °C. A typical multimode reader can only heat the microplate chamber, usually requiring an offset of 2-5 °C above the current room temperature. This traditional approach to temperature control eliminates flexibility and will result in sub-optimal experimental conditions, leading to unreliable or unusable data. This lack of functionality also limits your ability to investigate certain organisms or applications. Exemplary luminescent kinase assay, where the activity of a glow luciferase was measured at different temperatures. The luminescent signal increased approximately 10 % per 1 °C increase in temperature. Temperature plays a crucial role on biochemical assays using enzymes derived from non-mammalian organisms. 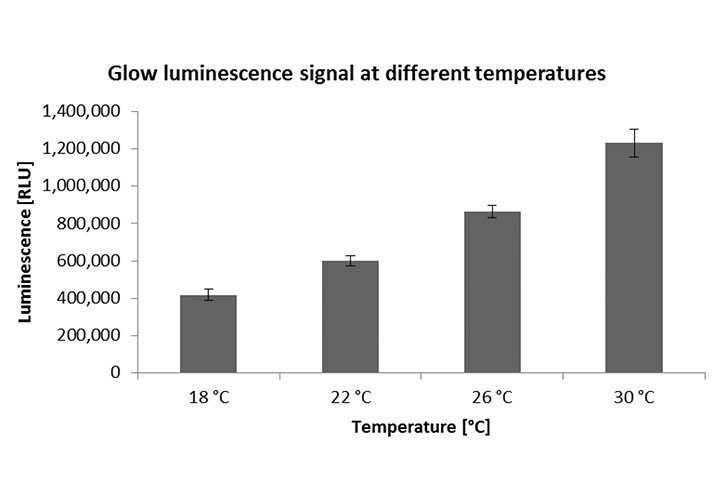 For example, bioluminescenct assay systems require optimal temperatures between 20 and 25 °C. These assays are usually highly temperature sensitive, with even a 1 °C increase in temperature leading to a 10 % increase in luminescence output. Luminometers or multimode readers that cannot stably control temperature in this critical range will therefore generate irreproducible data. Spark is the only reader that can mitigate the impact of temperature on your luminescence assays, yielding higher quality data for your valuable research. Multiple users require multiple experimental conditions. A major bottleneck for microplate readers is waiting for an instrument to reach the desired temperature. Heating up the measurement chamber is easy, but what if you have to wait for it to cool down? It typically takes over 60 minutes for a reader to cool down from 37 °C to room temperature through passive cooling, costing you valuable time and disrupting your busy schedule. Imagine the time delays and decrease in productivity you could avoid in a multi-user lab by just shortening that cool-down window. The Te-Cool module gives you active cooling of the microplate chamber, resulting in significant time savings. Labs can effectively reduce their cool-down time going from 37 to 22 °C. Luminescent signal over time in a kinetic measurement. During a measurement time of 6 min, the luminescent signal increases due to heating of the liquid in the wells). Researchers in every lab are constantly being pushed and pulled to make the next discovery on limited assets. Whether the constraint is driven by budget or time, we have all felt the burden. Spark brings together a unique set of features intended to ease this strain and create new workflow possibilities for your laboratory, reducing hands-on time while producing high quality data for each and every sample. Whether you are looking to design long-term experiments that work around your schedule, attempting to shrink sample volumes to reduce costs, or trying gain access to multiple instruments on a tight budget, Spark gives you control over your priorities. As scientists, we consider ourselves data-driven. Whether your research is centered in academia or industry, your next discovery will rely on your data. The ability to generate reliable, reproducible and high quality data should be a prerequisite for all laboratory instruments. Every time you run an experiment you invariably introduce some level of error that impacts your results. Variability is hard to avoid, whether it is transferring your cell-based assay between instruments or manually assessing confluence. Whether the errors are human subjectivity, environmental factors or contamination, you are influencing your results. Completely eliminating this variability isn’t realistic, so you are forced to make concessions. But isn’t your data too important to compromise? Spark is designed to address almost every detail of the most demanding assays and applications, delivering technologies that seamlessly work together to allow you to generate accurate and consistent data, each and every day. Open Kinetic allows you to pause and resume kinetic reads. In the case of long-term experiments or experiments with long reading intervals, this feature enables other users to perform separate applications between kinetic measurements. Live Viewer allows the user to monitor cells under optimal or physiological conditions in real-time. Integrated flurophore library with more than 60 fluorophores allows easy and precise visual selection of emission and excitation wavelengths. High resolution 3D scanning provides simultaneous excitation and emission scans, giving you the ability to quickly identify changes in the spectral properties of fluorescent probes and characterize unknown fluorescent samples. Automatic adjustment of gain settings during a measurement means you never have to compromise on sensitivity, allowing the detection of very low signals. SparkControl takes care of everything, correlating and displaying all of your results in one single data set. Significantly improve the quality of your results with enhanced sensitivity in top reading fluorescence intensity and fluorescence polarization assays. The automated z-focus adjustment determines the focal point for the best signal-to-blank ratio in each microplate well, regardless of the plate type, well shape or sample volume. This unique feature makes it easy to set up your reader for optimum performance with varying assay parameters. SparkControl’s one-click applications epitomize our effort to put fast, simple instrument operation at your fingertips. Obtain a more accurate signal from each well, even with inhomogeneous cell layers. High definition well scans give you a qualitative image of the cell distribution, effectively giving you a complete picture of the cell population. In combination with Spark’s unique environmental control options – including the GCM™ and Te-Cool™ module – SparkControl makes it easy to adjust parameters on the fly. You have full control of the environmental conditions during a run, including the temperature (even below ambient) and the CO2 and O2 levels inside the reader. SparkControl features a special Optimal Read (OR) function designed to improve cell-based measurements. OR delivers increased sensitivity for enhanced FI bottom reading by performing multiple measurements on spatially separated spots arrayed across each well. This allows you to achieve very low CVs with high intra- and inter-well reproducibility when measuring adherent cells in microplates. Safeguard your kinetic assays using automated gain regulation to avoid fluorescence measurements running into saturation. Measurements with different gain settings are then automatically correlated, allowing evaluation of the entire dataset. SparkControl Magellan is a data analysis package that provides you with powerful data reduction tools for numerous detection modes. You gain access to an array of features designed to enhance functionality, simplicity and security for a variety of microplate-based applications. With its built-in cell counter, Spark can analyze a broad range of cell sizes and types, providing fully automated, label-free cell counting and analysis in less than 30 seconds. Spark-Stack™ plate stacker for walkaway automation of Tecan Spark® readers Enhance the productivity of your lab with this compact, reliable and field-upgradeable plate stacker. Spark-Stack takes care of typical process steps, such as loading, unloading and re-stacking of non-lidded 6- to 1,536-well plates, and provides a throughput of up to 50 plates per run. The Optimal Read function for fluorescence bottom measurements is designed to enable uniform well illumination during excitation while and whole-well emission for 6-to 384-well plates. Performing multiple measurements on spatially separated spots arrayed across each well ensures that even heterogeneous cell layers can be effectively and reproducibly analyzed. 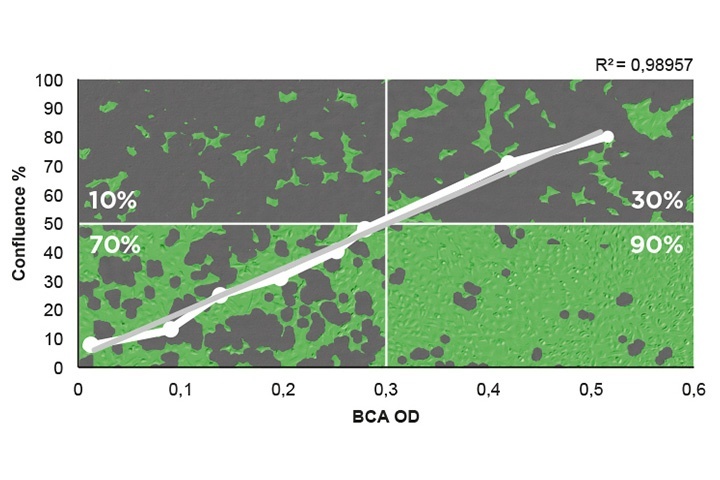 This application note shows that the Optimal Read function produces the most reliable results for the analysis of adherent cell types, giving the highest well-to-well uniformity and best sensitivity for cell-based applications. Cell counting, viability analysis and determination of size distribution are routinely performed by researchers across multiple disciplines, from standard cell passaging for downstream experiments to using insect cells infected with baculovirus to produce recombinant proteins, or determining the differentiation capacity of stem cells. Tecan’s Spark multimode reader has an integrated, bright field cell imaging module. This patent-pending system enables label-free cell counting, size distribution determination and trypan blue-based cell viability analysis with an easy-to-use, disposable Cell Chip™. In this study, the analysis of cell concentration, cell viability and size distribution for the determination of the optimal protein production rate in recombinant Sf21 cell cultures is presented. HTRF is a time-resolved fluorescence resonance energy transfer (TR-FRET)-based assay system from Cisbio Bioassays, and is becoming increasingly popular for the analysis of various molecular interactions and binding studies. HTRF assays place high sensitivity demands on multimode readers. The Spark offers a number of features to meet these demands and to ensure optimal assay performance, including Tecan’s unique Fusion Optics which combine the sensitivity of filters and the flexibility of monochromators (MCRs) in one instrument. In addition to entirely filter- or MCR-based measurements, a combination of the two can be used simultaneously within one measurement. This application note describes the successful implementation of AlphaScreen on the Spark multimode reader, as well as the performance of the instrument with regards to measurement sensitivity, uniformity and typical read times. This application note describes the implementation of the AlphaScreen technology on the Spark multimode reader and the detection of tyrosine kinase activity using the AlphaScreen P-Tyr-100 Assay Kit. This application note describes the implementation of the AlphaLISA technology on the Spark multimode reader and its use for the detection of human immunoglobulin G (IgG) using the AlphaLISA IgG Assay Kit. Tecan’s Spark multimode microplate reader with integrated cell imaging simplifies cell culture, featuring quality checks and signal normalization to cel lconfluence, thereby boosting automation of cell-based studies. Keep control of crucial experimental conditions with the first air conditioning system for a multimode reader – enabling stable measurement chamber temperature down to 18°C. 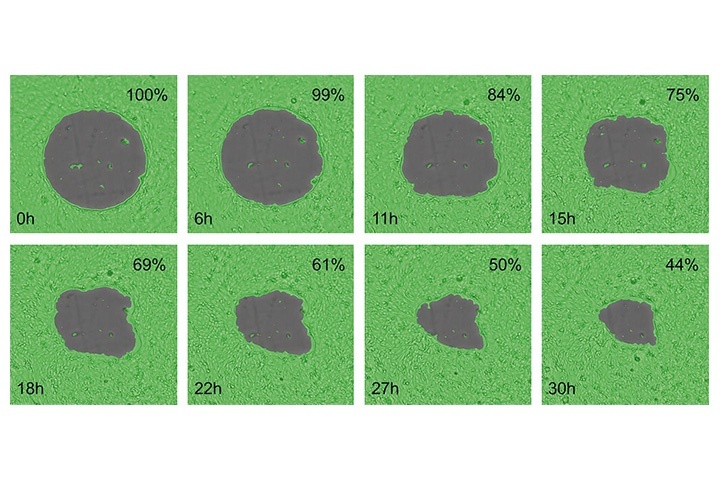 Assaying cells in an appropriate window of time after a compound-­mediated cytotoxic event can be extremely challenging. 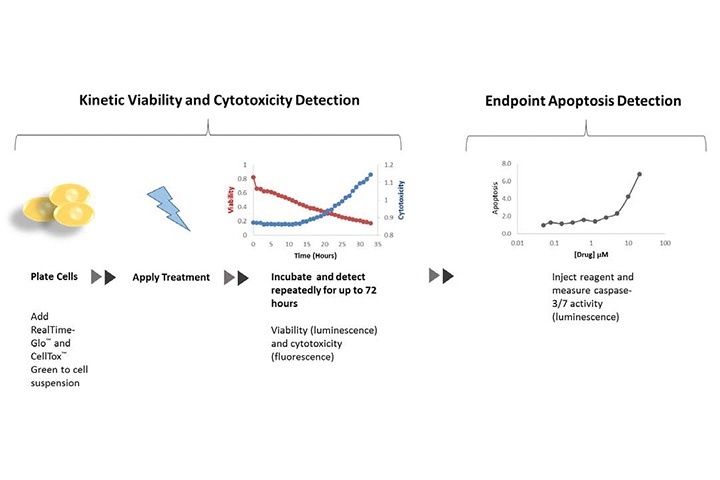 This note describes the automation for kinetic monitoring of cytotoxicity and viability using three Promega assays for viability, cytotoxicity and apoptosis assessment with the Spark multimode reader. Cell migration is a central process in the development and maintenance of multicellular organisms, with tissue formation during embryonic development, wound healing and immune responses all requiring the orchestrated movement and assembly of cells. 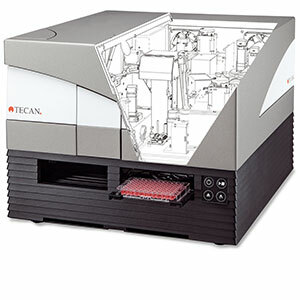 Tecan’s Spark multimode microplate reader was used for the real-time analysis of human stem cell proliferation and differentiation, using established assays for cell viability, proliferation and apoptosis assessment in a reliable and convenient manner. 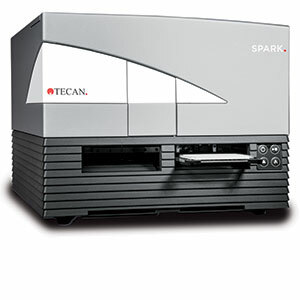 Tecan’s Spark multimode microplate reader was used to identify metabolic changes during the differentiation of human mesenchymal stem cells and to assess and quantify cell viability, cytotoxicity and apoptosis, using several well-established and reliable cell-based assays developed by PromoCell. For many cell biology applications – such as the identification and separation of high expression clones or knock-down candidates, and small-scale antibody or protein production – it is important to ensure that cell lines originates from a single cell, i.e. they are monoclonal. This can be a major bottleneck, especially for academic laboratories, as dedicated automated microscopy systems are both very expensive and complex to operate, meaning verification of monoclonality is often performed by manual microscopy. Homogeneous Time-Resolved Fluorescence (HTRF) is a time-resolved fluorescence resonance energy transfer (TR-FRET) assay system developed by Cisbio Bioassays, and offers a reliable technique for high throughput screening (HTS) and the analysis of molecular interactions. The assay is based on energy transfer between a long-lived europium or terbium cryptate donor and a variety of red or green acceptors, and combines the advantages of FRET and time-resolved fluorescence (TRF). Spark-Stack is a compact, versatile and field-upgradeable microplate stacker for the Spark® multimode reader. 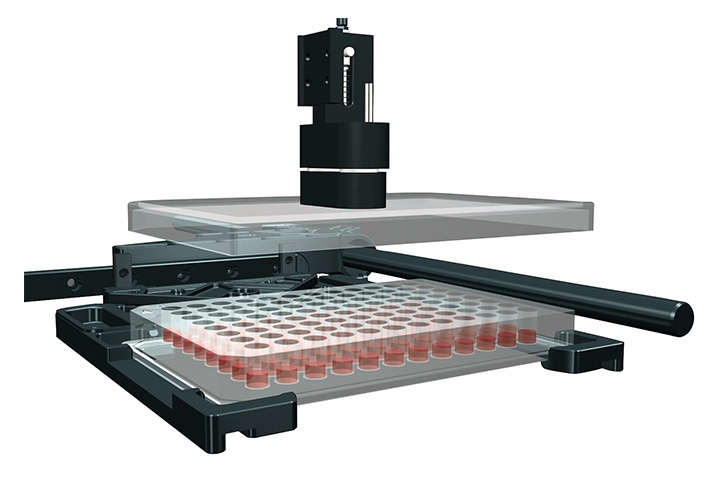 It offers walkaway automation and enhances the productivity in the lab by helping to automate typical workflow steps – including plate loading, unloading and restacking of 6-1536-well microplates. 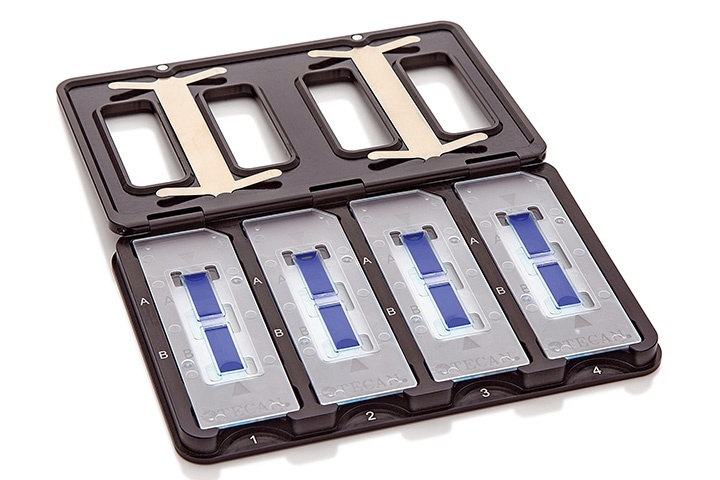 Spark-Stack can be equipped with dark covers to protect light-sensitive assays inside the plate magazines, such as Alpha technology-based assays and fluorophore-transfected cells. The one-click Live Viewer software application turns the Spark microplate reader into a microscope. It enables easy and straightforward visual quality checks of cells in microplate wells or in Tecan's proprietary Cell Chip™, allowing researchers to automatically acquire and instantly view images of their cell samples immediately before the measurement is started. The Spark reader is equipped with Tecan's unique Fusion Optics, which combine the benefits of filters and MCRs in a single multimode reader. The Spark can be equipped with filters, Quad4 Monochromators or a combination of both using the ingenious Spark Fusion Optics. The new Spark multimode microplate reader is equipped with patent-pending High Speed Monochromators (HSM) enabling highly accurate, reproducible and ultra-fast absorbance measurements. This unique optical system offers an enhanced measurement range from 200 to 1,000 nm, ensuring optimal performance across the full range, particularly for absorbance measurements in the deep UV range, such as A260/A230 nucleic acid purity checks. The Spark reader is also suitable for measurements of low volume samples in both absorbance and fluorescence modes using the patented NanoQuant plate. With the Spark‘s luminescence module, users can perform high sensitivity flash and glow luminescence measurements. For optimized signal detection of very high and low signals within one experiment, optical density (OD) filters help to attenuate strong signals in the range from OD1 to OD3, thereby avoiding ‘over’ readings. 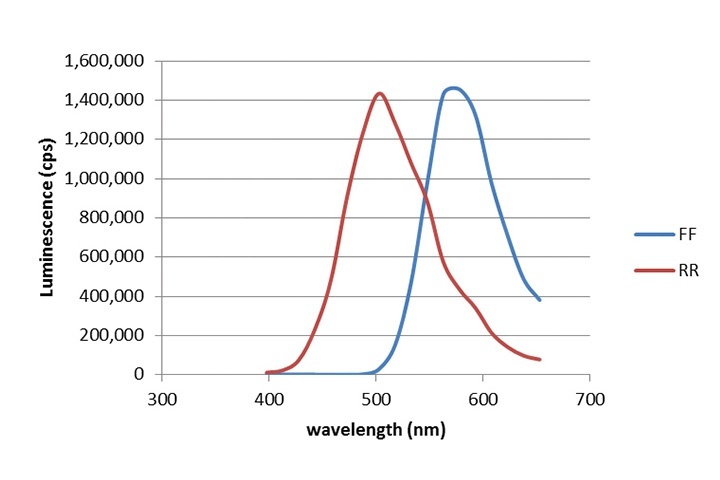 This enables users to detect luminescence signals with a dynamic range of more than 9 orders of magnitude.Multicolor luminescence assays with up to five different luciferases, as well as luminescence spectral scanning (eg. 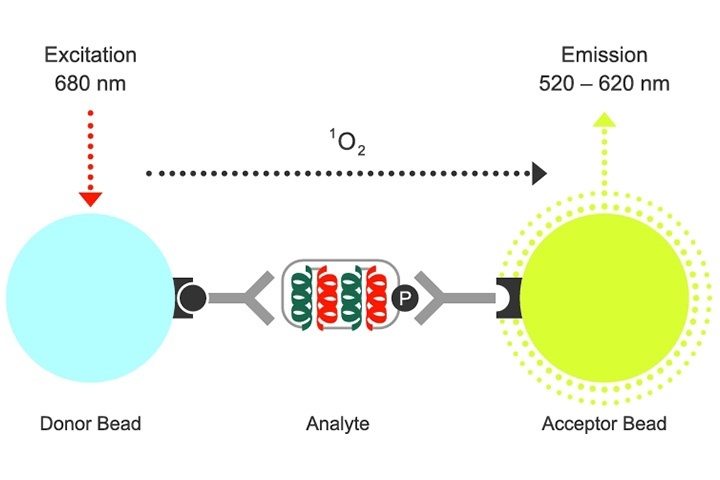 of luminescent proteins) can be easily set - using an innovative filter-based approach, users can select any wavelength between 398 nm and 653 nm, with a step size of 15 nm and a 25 nm bandwidth. This technical note describes the optimized test set-ups, instrument settings and statistical equations that were used to determine the maximum instrument sensitivity of the Spark multimode reader for flash and glow luminescence. 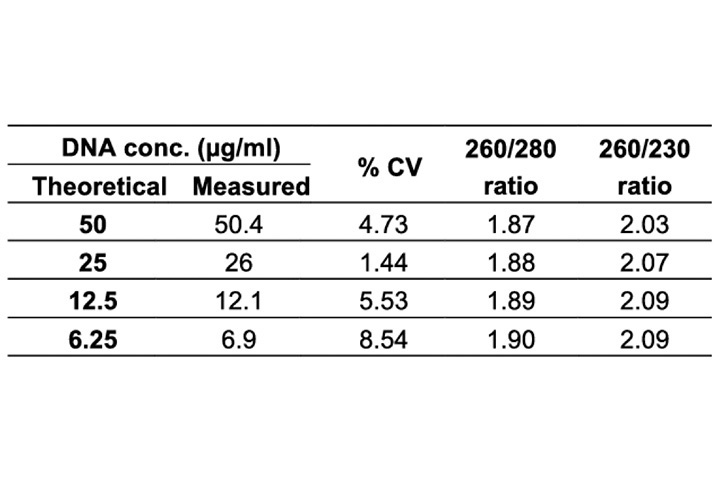 This technical note describes the optimized test set-ups, instrument settings and statistical equations that were used to determine the best possible detection limit for standard fluorophore label in fluorescence intensity top reading mode (FI top). This technical note describes the optimized test set-ups, instrument settings and statistical equations that were used to determine the best possible detection limit of europium in time-resolved fluorescence intensity reading. This technical note describes the optimized test set-ups, instrument settings and statistical equations that were used to determine the best possible detection limit for standard fluorophore label in FI bottom mode. 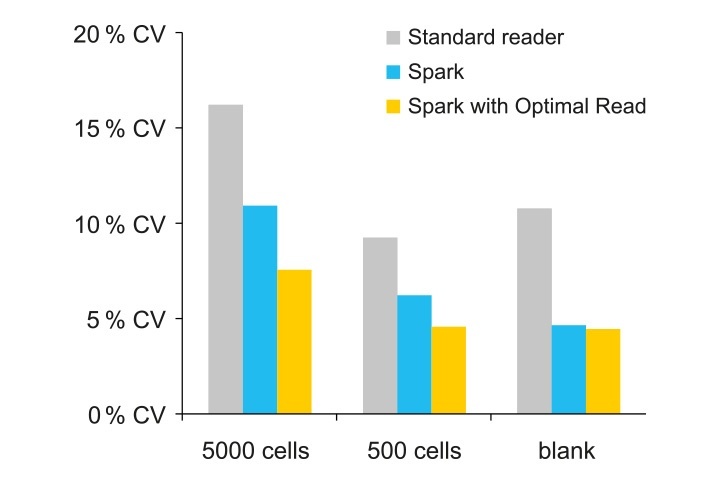 In this technical note, we demonstrate the superior performance of the Spark reader compared to two other multimode readers from different providers. The detection limit for the far red fluorescent dye Alexa Fluor 647 – which has a fluorescence spectrum comparable to Cy5 – was determined, operating each instrument in MCR mode. This technical note describes the implementation of the DLR Assay System on Tecan’s next generation high-end multimode reader platform Spark. It can perform high sensitivity flash and glow luminescence measurements with a dynamic range of more than nine orders of magnitude. In addition, its enhanced luminescence module can measure multicolor assays with up to five different luciferases, as well as offering spectral scanning of luminescent substances. This Technical Note describes the functions and benefits of the Spark multimode microplate reader and cell imaging module, as well as the SparkControl software and its dedicated Cell Counting and Cell Viability Application. This technical note compares the performance of the Spark’s cell counting module with (i) manual cell counting using C-Chip™ disposable hemocytometers and a standard microscope, (ii) a comparably priced, imaging-based cell counting device (Device A) and (iii) a high performance cell imager with counting capabilities (Device B). The Transcreener® ADP2 TR-FRET Red Assay is a competitive immunoassay for ADP with a far-red, time-resolved fluorescence-resonance-energy-transfer (TR-FRET) read-out. It is intended for the detection adenosine diphosphate (ADP) production by any kinase or ATPase, and has been developed specifically for high-throughput screening applications. The Spark was tested for its capacity to measure the Transcreener ADP2 TR-FRET Red Assay using the four different combinations of the Fusion Optics. 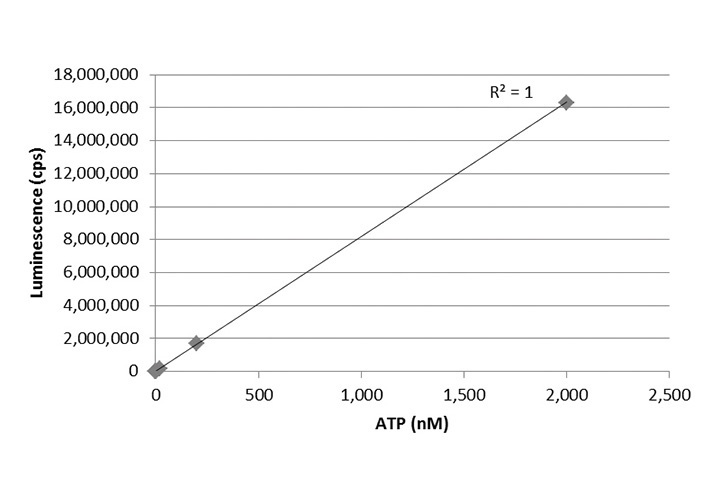 The Transcreener ADP2 FP assay is a competitive FP assay based on the detection of ADP and is therefore compatible with any enzyme class that produces ADP, including protein, lipid, and carbohydrate kinases, ATPases, DNA helicases, carboxylases and glutamine synthetase. This technical note describes the instrument settings for the Transcreener ADP2 FP assay on Tecan’s Spark multimode microplate reader. Tecan’s Spark multimode microplate reader with integrated cell imaging simplifies cell culture, featuring quality checks and signal normalization to cell confluence, thereby boosting automation of cell-based studies. 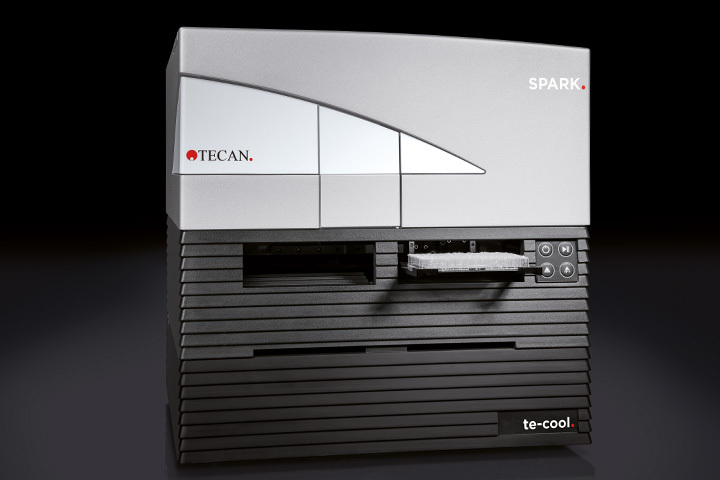 Tecan has launched the Spark® multimode microplate reader, offering tailor-made solutions to suit virtually any drug discovery or advanced life science research application. This freely configurable system gives researchers access to new techniques and features intended to enhance and streamline biochemical and cell-based workflows. At the heart of the instrument are Spark’s unique Fusion Optics and a powerful, ultra-high frequency xenon flash lamp, which can be combined with your choice of high performance detection modules to ensure a perfect match for your workflow. Options include an enhanced fluorescence module designed to improve sensitivity and increase the speed of high throughput screening, and the newly developed Te-Cool™ cooling module that uniquely allows the measurement chamber temperature to be set below the ambient room temperature for more accurate and reliable results. The Spark cell handling capabilities have also been extended, with a new automated cell imaging and confluence measurement feature. This allows incubation and monitoring of cell culture microplates within the measurement chamber, enabling the user to define the confluence at which the assay starts/ends or the substrate is injected, for optimal assay results and greater walkaway operation. 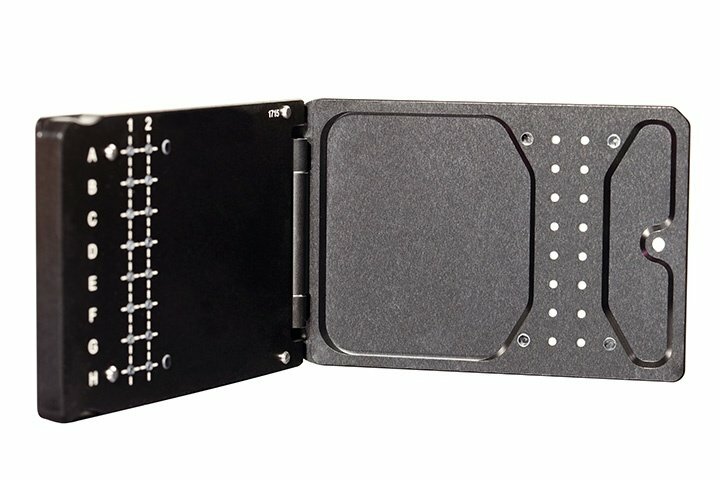 These new options – combined with the ability to read 1- to 1,536-well microplates – ensure there is a Spark configuration to increase the productivity of your lab, both today and in the future. Dr Gediminas Vidugiris of Promega and Dr Katrin Flatscher of Tecan talk about the temperature susceptibility of many biochemical assays and how temperature fluctuations in the lab can distort measurement results. They discuss ways to achieve stable temperature conditions throughout the entire experimental workflow using the Te-coolTM active cooling functionality in the Spark microplate reader. 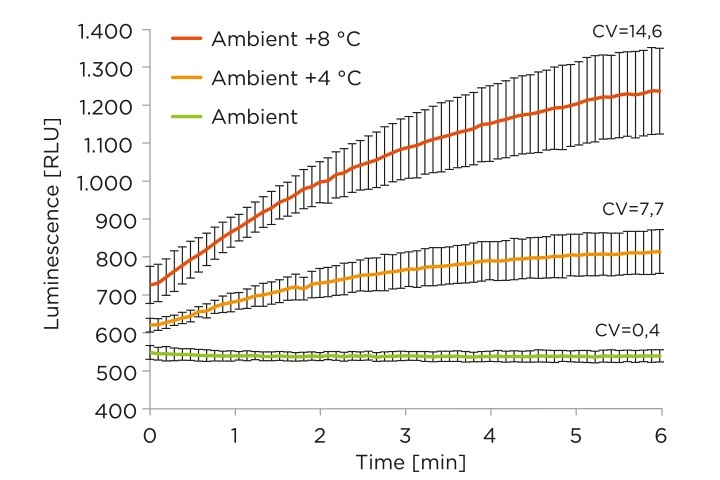 The benefits of active temperature control are demonstrated on the basis of experimental data from cell-based bioluminescent and biofluorescent assays assessing cell viability, metabolism, death and signaling.